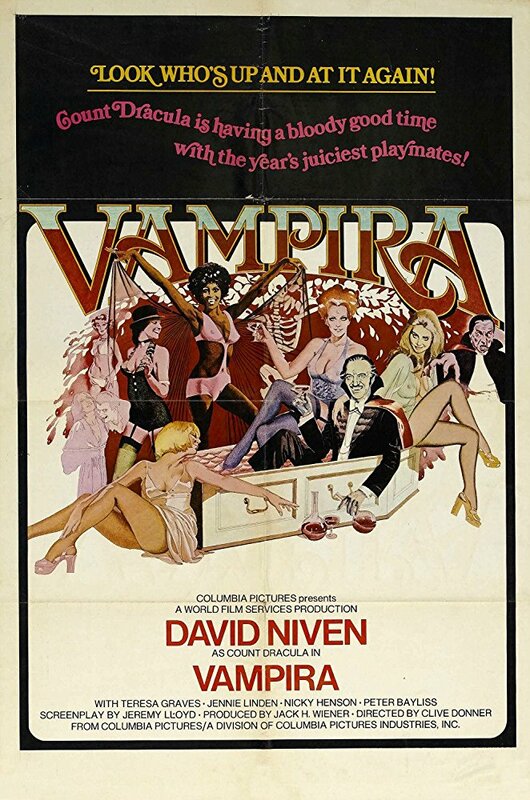 Suave David Niven plays Count Dracula in this early 1970's horror comedy which lacks in both departments. Count Dracula aims to bring his wife Vampira who has been sleeping for 50 years back to the world of the living dead. His only hope of this is finding the right blood that can bring her back. When a group of young women come to visit his castle in Transylvania he finds the blood he requires. Unfortunately during the blood transfusion the blood required gets mixed up and his once white wife wakes up black. What ensues is a lacklustre comedy with Teresa Graves as the now black Vampira being one of the highlights. Upon following the women back to London the old Dracula does his best to get his wife back to being white, but things are never as easy as they should be. Horror fans will enjoy the brief moments of Linda Hayden (THE BLOOD ON SATANS CLAW) showing up and Veronica Carlson who was a star of many Hammer horror films. 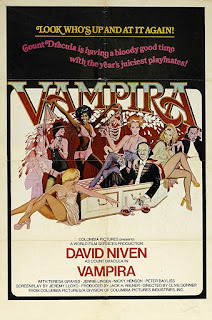 This could have been the spoof film for vampires for what YOUNG FRANKENSTEIN did for the monster but David Niven showing his fangs every now and again, and the painfully unfunny script leaves you wanting to watch the former mentioned movie. Despite the unfunny script it is worth watching this if only to see what David Niven can do in the role of Count Dracula, and his bemused looks upon hearing his now black wife saying things you would find in a Blaxploitation film. David Niven was a fantastic actor and always great to watch. For my generation, it would have to Christoper Lee.